Belize Audubon Society partners with BELTRAIDE to improve community development. 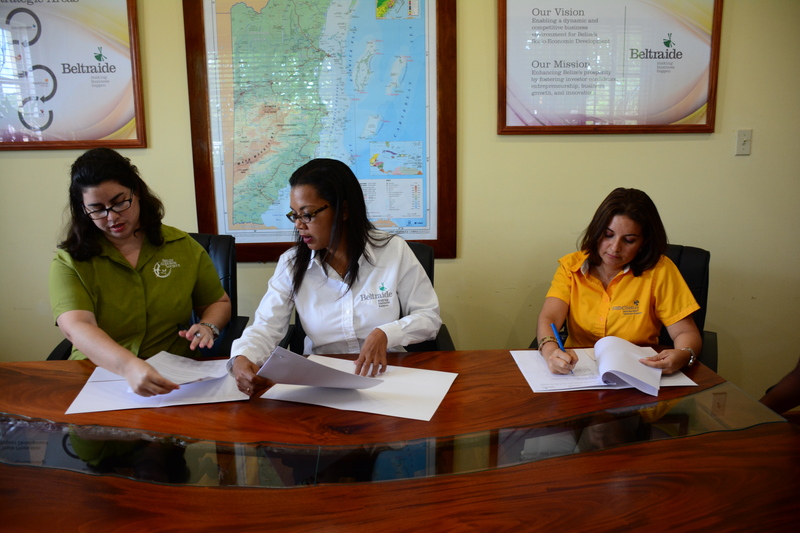 Mrs. Amanda Acosta, Executive Director, Belize Audubon Society, along with Ms. Lejia Melanie Gideon, General Manager, Enterprise & Innovation Division and Mrs. Nilda Riverol signing the MOU. BELTRAIDE through the Small Business Development Center (SBDCBelize), has signed a Memorandum of Understanding (MOU) with the Belize Audubon Society (BAS) at the Belize Training and Employment Center conference room, solidifying a partnership to assist business located in buffer communities around the protected areas. The Belize Audubon Society (BAS) is a non-governmental conservation organization working for over 45 years in Belize, focusing on protected areas management, environmental education, advocacy, biodiversity research and monitoring, and community development. Through the community development and outreach program, communities are engaged in sustainable development initiatives to improve their livelihoods and support conservation. For over 20 years, BAS along with various funders and partners have assisted in building resilient communities through skills training and capacity building in agro-processing, craft making, sustainable fishing, small business development and eco-tourism. Our partnership will allow BAS to continue programs geared towards community development. Mrs. Amanda Burgos-Acosta, Executive Director, believes that this working-relationship will further demonstrate BAS commitment to empowering these communities through the execution of trainings and business advising by SBDCBelize.